Rockland County Executive Ed Day ran into the sharp end of a judicial ruling today when a New York Supreme Court judge overturned his ban on all unvaccinated children in public spaces, calling it “arbitrary and capricious.” Acting Supreme Court Justice Rolf Thorsen ruled in favor of parents who challenged the Rockland County executive order in court. Thorsen ruled that any emergency ban could not last more than five days, while Day wanted a thirty-day ban. The judge ordered that all children affected by the ban be immediately returned to school and welcomed in public spaces while declaring that the ban cannot be enforced. Day had threatened the unvaccinated citizens of Rockland County with up to six months in jail if they violated his ban. Justice Thorsen also called into question the county’s definition of a “health emergency,” saying that 166 measles cases in a population of 330,000 does not meet the legal requirement of an epidemic. Another shopper standing next to him suddenly dropped the item she had been holding and clutched her child. “She was buying something, and she just threw it down,” Ms. Wingate recalled. “She said, ‘Let’s go, let’s go! Jews don’t have shots!’”…And so some residents say they now wipe public bus seats and cross the street when they see ultra-Orthodox Jews. Hasidic leaders said they feared not only a rise in anti-Semitism but an invasion of their cloistered community by the authorities under the guise of public health. 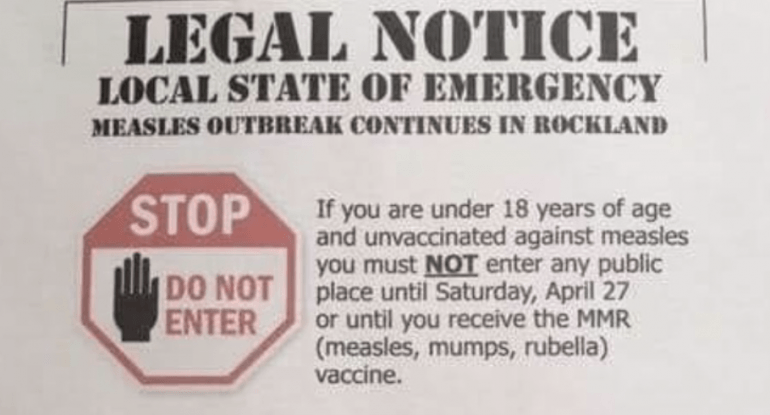 …Steve Gold, the chairman of the Jewish Community Relations Council for the Jewish Federation of Rockland, shared Mr. Wieder’s concerns, saying the move by county officials risked exacerbating the anti-Semitism that already existed in the area before the measles crisis. He pointed to a number of anti-Semitic episodes, including swastikas spray-painted on trees. The answer from Judge Thorson is no. The panic that Rockland County has caused with the ban that mostly affected Jewish children was ill-conceived and a major overstep. According to the CDC, measles has killed one person in the United States in the last ten years. In comparison, the flu killed 80,000 people last year and no county is insisting on banning people who don’t get flu shots from school or grocery stores. The disparity is glaring and at least one judge has called out the obvious error in judgment. But the attack on religious objectors in New York isn’t over yet. Legislation has been introduced to repeal religious exemptions for vaccines in the state legislature and is being pushed by Democrats.